To me, there is nothing more majestic than the American Bald Eagle. In pursuing my passion of photography, the bald eagle is a favorite subject of mine. From near extinction, the bald eagle population has grown enormously. 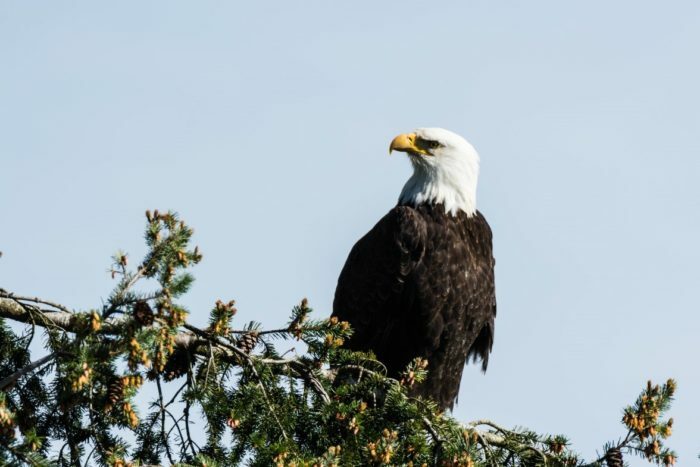 Saving the bald eagle is a wildlife success story that involved changing hunting laws, curtailing pollution and other measures of conservation. In short, it required all parties to make changes on how they interacted with the bald eagle ecosystem. And the result was a big win. But sadly, it is time to update our endangered species list. The signs were there. The warnings were ignored. Behaviors did not change. No big surprise, the latest endangered species is our key target talent. As you go to your favorite internet hunting places, perhaps you have noticed the species of talent you need is no longer plentiful. The cry of talent shortages rings around the globe. Instead of waiting for the talent to come to us, talent safaris were organized to actively hunt the talent. We learned all the Boolean hunting tactics in an attempt to track our prey. We invested in the latest technology in order to track our quarry into even the deepest digital hunting grounds. We invested in tools that afforded us the opportunity to engage multiple targets at the same time, as it turns out, that only accelerated the talent migration. A recent talent report on “digital deserters” by Corporate Executive Board (CEB) points out the approaches that the target talent is taking to elude the many talent hunters. A cursory glance at the graph below indicates that target talent has taken steps to ignore, hide and even move away from the digital hunting grounds. The promise of the Internet and its Social Revolution was that target talent was much easier to identify. A decade ago, Social Recruiting was all the buzz; the talent was plentiful and the numerous social platforms opened up new digital hunting grounds. But over poaching, the overuse of amateur tactics and a general exploitation of talent has resulted in some very challenging trends, especially on the digital platforms as the CEB data concludes. Ignored a message about a job opportunity: Comment-as advertising stopped attracting the ideal candidates, the savvy hunters’ added email recruiting as a tactic to attract the talent. This worked for a season or two, but as more recruiters/sourcers adopted this approach, the talent started ignoring our emails and InMails. Today 41% of talent surveyed indicated they ignored the message about a job opportunity. Made it more difficult to be found on the Internet: Comment-many of us saw signs of this with technical talent on LinkedIn as many potential prospects removed specific information about their skills. To counteract this, we discovered social data aggregators that opened up professional networks and communities. Reduced activity on online professional networking site: Comment-it didn’t take long for the target talent realize that we were tracking them to their most private of places. Looking for trophy talent, we invaded those areas boldly and without a lot of thought for the collateral damage our activities could cause. CEB reported that nearly 20% of the target talent were contacted by 10 or more organizations last year. That caused the targeted talent to take countermeasures by not being active in their communities and fell in the rankings on the social data aggregators. Not to be deterred we expanded our outreach to all of a given species. That resulted in the next reaction by the target talent…. Made it more difficult to be contacted: Comment-the email invasion and our expansion of digital hunting grounds caused the desired target talent to retreat to the shadows. For over one-third of the talent, we no longer see the full profile of an individual, instead, we see only silhouettes. Deleted online professional networking profile: Comment-even the digital silhouettes of talent are disappearing as the target talent moves out of this digital territory leaving recruiters/sourcers wondering what to do next. CEB found that nearly 25% of the talent surveyed deleted a profile on social media. As job board advertising and email recruiting become less effective; what do we do? Just as we have brought the American Bald Eagle back from extinction, there are strategies for preserving our target talent. The short answer is we must have a better relationship with the talent ecosystem. The longer answer lies with how we use the resources at our disposal. We can change our approach to hunting; we can build game preserves, and we can employ a variety of conservation measures. But first, all of us need to acknowledge the problem and commit to taking corrective action. We must treat our scarce human resources like we deal with the scarcity of natural resources. More of the same is going to result in more of the same. Marvin Smith is veteran talent acquisition practitioner who focuses on strategic talent sourcing, talent community building, social recruiting, employment branding, and the use of technology to drive talent identification and engagement strategies. He has been on teams that were at the forefront of resurgence of talent sourcing as a strategic weapon in talent acquisition. These teams piloted groundbreaking programs (ERE-Media-award-winning) work that used business intelligence, data, and technology to segment the target talent audiences and build talent pipelines and communities. His current role is a strategic talent sourcing consultant with Lockheed Martin, where he is responsible for talent pipeline building for critical skills talent; project management of a RMP (recruitment marketing platform); and driving corporate-wide, talent community initiatives. Previously, he served as senior research recruiter on an internal executive recruiting team with the Bill & Melinda Gates Foundation; a strategic sourcing program manager with Blackberry (Research In Motion); and a talent sourcer/program manager for Microsoft. He is a writer and speaker on the topics of talent communities, strategic talent sourcing, Moneyball sourcing, and talent acquisition strategies. You can follow his blog or join a community that he created on talent community development or follow him on Twitter.